Read on to get to know Angela a little better! I found out about Hatch Canada in my search for education-related jobs. I applied in the hopes of gaining more experience as a teacher. Much to my own surprise, I quickly became very passionate about the mission and values of Hatch and love teaching kids how to code. What’s your background in coding? Did you learn how to code when you were a kid? Before Hatch, I didn’t have much experience with coding. I taught myself HTML in high school for various websites and blogs. Working with Hatch has provided a wonderful opportunity to learn more about code and code literacy. What’s your favourite part about working as a coach at Hatch? I love seeing the enormous amount of creativity that kids bring to the table and seeing them excited to learn something new. I also love the job because I know I’m helping students and teaching them something that is incredibly important. It’s also amazing to be a part of such a fun community. We agree - Hatch Canada is an awesome place to be. Speaking of which, have you ever seen a child experience a moment where they got excited about coding? We’d love to hear about it! One of the best parts about Hatch is that we get to see children excited about coding every single day. It’s nearly impossible to think of a class where most of the students aren’t getting excited about new ideas, or the fact that they learned something new. Kids are constantly showing off their projects to each other and their coaches, and helping each other with new concepts to make their projects even cooler. So, why do you think that learning to code is important? In my work both at Hatch and in pursuing my M.Ed. in Literacy, I’ve learned how incredibly important code is, and I could go on forever about the benefits of learning how to code. Teaching kids how to code is preparing them for the future. Coding will be a beneficial skill and understanding in any possible career of the digital future. Not only that, code emphasizes the importance of developing skills that apply well beyond computer science and can be taken into the real world. Code enforces traditional literacy skills. It requires children to develop fluency in the language and to be able to manipulate language in very specific ways. Children develop logical thinking, computational thinking, the use of sequencing, problem-solving, and endless STEM and math skills and understandings. Coding helps students to develop a well-rounded understanding of many important concepts that appear in their traditional classrooms. Thank you, Angela, for sharing your insights and letting us learn a bit more about you. We couldn’t do it without you and the awesome coaches like you! Think your child may be interested in the world of coding? Want to give them a leg up in their education for the future? 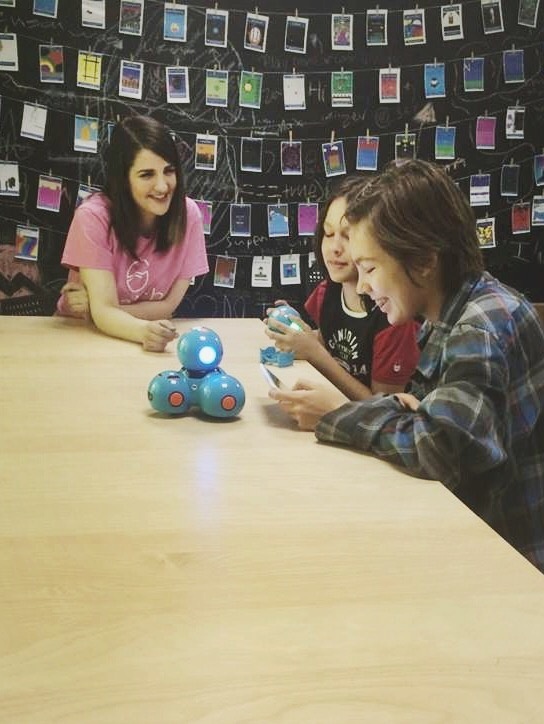 Hatch can help set them up for success by providing them with the foundational skill set for coding. If you’re interested in joining the program, take a trial class today!